I have been traveling alot lately. Up and down the highways and byways of this metroplex. I have noticed this poster at certain locations of a certain convenient store. 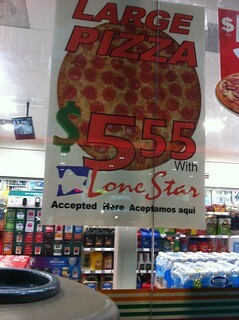 For 5.55 you can get a pizza – and pay for it with your LoneStar card…which if you aren’t familiar is basically “food stamps” or government assistance for the needy. It’s a great marketing gimmick and another revenue source for the store – I see that angle ….but I can totally see how some would consider it pandering or even insulting to their customers.